God is called the creator because the bible says He created everything. He also imbued that quality into us, some more so than others. I have a bit of a creative streak. I enjoy writing and decorating cookies. But while my writing has sparks of originality, the cookie decorating is really just copying well. I may have great ideas and concepts in my mind, but I lack the ability to draw them myself to make them known. The other day I found myself somewhere I never thought I’d be, doing something I never thought I’d do, in the presence of a very gifted artist. You could even call him a creator. My husband decided to get another tattoo. He got his first two tattoos many years ago, before we met. He’s dragged me into several tattoo pallors over the past year or two and I never felt overly comfortable in them. But recently we found out that a young man we’d known since he was in junior high, had become a tattoo artist. He had always been an artistic kid. Kind of a different sort of kid. But I’d always connected with him. Tim decides to get that logo image, which is in my head, as a tattoo. We go visit Aaron and relay the concept to him and explain the ministry focus. He draws up a concept, measures Tim’s calf and says he will call us soon. A week later he sends a design image to us and I am blown away! Aaron has captured the concept far better than I can imagine. It’s a line drawing and I think it’s awesome. How little do I know. Then a few days ago we go in to get the work done. I watch as he puts on the stencil and traces the outline on Tim’s leg. I’m thinking it’s looking pretty good but he’s just getting started. He adds shading, puts in more detail, inks, wipes off ink and blood, inks some more. I’m sitting there amazed. This is so much more than what I saw in that line drawing. It is so much more than the image in my mind. Three hours pass. Tim’s leg is petering out. We have to finish the rest at our next appointment, in two weeks. What’s on his leg is amazing. What the finished design will be I can only imagine! This whole thing got me thinking about God. (I know, God in the tattoo pallor but why not? ) The artist knows what he wants to create. He sees the end result before he ever starts his work. It may look rough along the way. He adds some color, takes some off, cleans, causes some pain and bleeding, and gets working at it again. His hand may go numb throughout the process. He sets his tools down for a minute but picks it back up again. The cycle repeats and repeats until the image he sees is the image he had in mind from the beginning. Only then is he satisfied. How much this process of watching Aaron the artist work compares to watching God the Father work! God knows what we are designed to be. He never gives up until he sees us as He created us to be. Sometimes it’s messy. Sometimes we even bleed. But always it is worth the end result. Aaron has a gift. 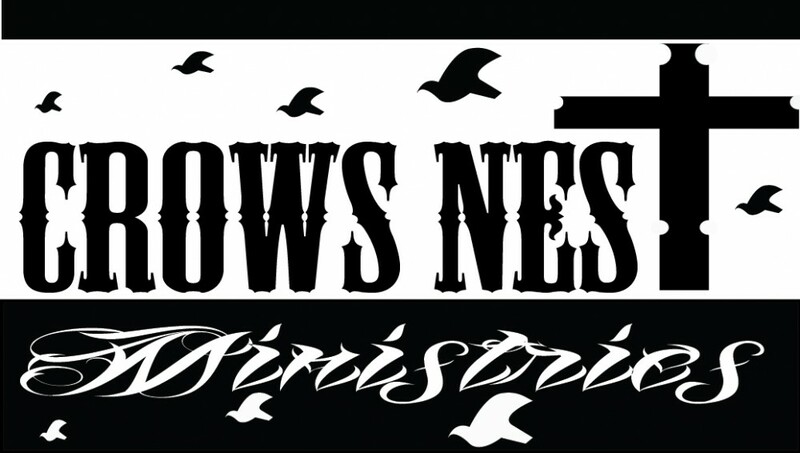 I am grateful that he decided to use it to create this image, which will be our Crow’s Nest logo. Whether he realizes it or not, God had this in mind when he created the artist in him. This entry was posted in Anne's Musings by tbremer. Bookmark the permalink.